When you create a new registration, a window will appear from which you can choose a registration form. In this window, you can hover over the i icons to learn more about each registration form. Each registration form includes its own draft questions. While Open-Ended Registration is the most broad and applicable to general uploads, there are several forms offered, some of which target different points in the research lifecycle. Learn more about each registration by viewing and filling out the templates of registration forms. OSF Preregistration: This is the standard preregistration form on OSF. You will be asked a series of questions to ensure that your sampling, design, and analysis plans are solidified prior to beginning your study. Open-Ended Registration: You will be asked to provide a narrative summary of what is contained in your project. There is no minimum character length. Registered Report Protocol Preregistration: This form is intended for those who have received an "in-principle acceptance" for a registered report from a journal (see https://cos.io/rr). You will be asked to provide your accepted protocol manuscript, the journal name, and the date of in-principle acceptance. Preregistration Template from AsPredicted.org: This form is a straightforward preregistration form in which you will be asked eight questions based on procedures from AsPredicted.org. OSF-Standard Pre-Data Collection Registration: You will be asked if data collection is underway and if you have looked at your data already. You will be provided an opportunity to post other comments about your project. Replication Recipe (Brandt et al., 2013): Preregistration: This form is intended for use when conducting a replication. You will be asked a series of questions about the study you intend to replicate. Replication Recipe (Brandt et al., 2013): Post-Completion: This form is intended for use upon completion of a replication study, as outlined by Brandt et al., "The Replication Recipe: What Makes for a Convincing Replication?" You will be asked to answer a series of questions about the outcomes of your replication and how they compare to the original study. 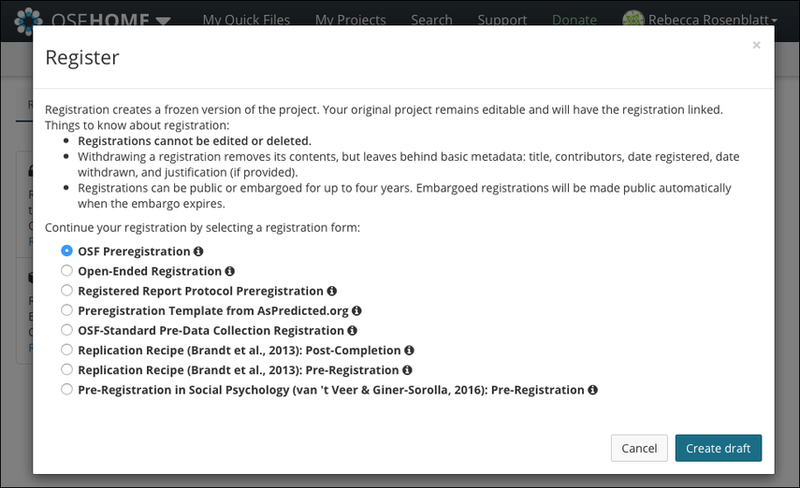 Preregistration in Social Psychology (van't Veer & Giner-Sorolla, 2016): Preregistration: This form is intended for use when conducting a preregistration. You will be asked to fill out the elements for a preregistration as described in: van't Veer & Griner-Sorolla (2016).